"Toronto Airport", "Pearson Airport", and "YYZ" redirect here. For other airports in Toronto, see List of airports in the Greater Toronto Area. For the airfield in the United States, see Pearson Field. For the instrumental piece from the Canadian band Rush, see YYZ (instrumental). Toronto Pearson is located 22.5 kilometres (14.0 mi) northwest of Downtown Toronto, with the majority of the airport situated in the city of Mississauga, and a small portion of the airfield extending into Toronto's western district of Etobicoke. It features five runways and two passenger terminals along with numerous cargo and maintenance facilities on a site that covers 1,867 hectares (4,613 acres). Pearson Airport is the primary hub for Air Canada. It also serves as a hub for WestJet, cargo airline FedEx Express and as a base of operations for Air Transat and Sunwing Airlines. Pearson is operated by the Greater Toronto Airports Authority (GTAA) as part of Transport Canada's National Airports System, and is the largest airport in the world with facilities for United States border preclearance. An extensive network of non-stop domestic flights is operated from Toronto Pearson by several airlines to all major and many secondary cities across all provinces of Canada. As of 2019, over 75 airlines operate around 1,250 daily departures from the airport to more than 180 destinations across all six of the world's inhabited continents. In 1937, the Government of Canada agreed to support the building of two airports in the Toronto area. One site selected was on the Toronto Islands in Downtown Toronto, which is the present-day Billy Bishop Toronto City Airport. 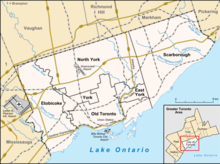 The other site selected was an area northwest of Toronto near the town of Malton, which was originally intended to serve as an alternate to the downtown airport but instead would become its successor. The first scheduled passenger flight at the Malton Airport was a Trans-Canada Air Lines DC-3 that landed on August 29, 1939. During World War II, the Royal Canadian Air Force established a base at the airport as a component of the British Commonwealth Air Training Plan. RCAF Station Malton was home to several training schools and was in operation between 1940-1946. In 1958, the City of Toronto sold the Malton Airport to the Government of Canada, which subsequently changed the name of the facility to Toronto International Airport, under the management of Transport Canada. The airport was officially renamed Lester B. Pearson International Airport in 1984, in honour of Toronto-born Lester B. Pearson, the fourteenth Prime Minister of Canada and recipient of the 1957 Nobel Peace Prize. The Greater Toronto Airports Authority (GTAA) assumed management, operation, and control of the airport in 1996, and has used the name Toronto Pearson International Airport for the facility since the transition. Toronto Pearson International Airport has two active public terminals, Terminal 1 and Terminal 3. Both terminals are designed to handle all three sectors of travel (domestic, transborder, and international), which results in terminal operations at Pearson being grouped for airlines and airline alliances, rather than for domestic and international routes. A third public terminal, the Infield Concourse (IFC), currently acts as an extension of Terminal 3 providing additional bridged gates. Terminal 2 was permanently closed and demolished in 2007, replaced by an expanded Terminal 1. Measuring over 346,000 square metres (3,724,000 sq ft), Terminal 1 is the largest airport terminal in Canada and the 12th largest in the world by floor space. Air Canada and all other Star Alliance airlines that serve Pearson are based at Terminal 1. Non-alliance airline Emirates also uses the terminal. Terminal 1 was designed by a joint venture known as Airports Architects Canada made up of Skidmore, Owings & Merrill LLP, Adamson Associates Architects and Moshe Safdie and Associates. It contains 58 gates: D1, D3, D5, D7-D12, D20, D22, D24, D26, D28, D31–D45 (D32, D34, D36 also serve US flights and carry F designation), D51, D53, D55, D57 (also carry F designation), F60–F63, F64A–F64B, F65, F66A–F66B, F/E67–F/E81 (F68-F73 and F78-F81 serve both US and international flights but E74-E77 are international only), F59, F82-F83, and F84-F99. Two of the gates, E73 and E75, can accommodate the Airbus A380. Along with the standard customs and immigration facilities, Terminal 1 also contains special customs "B" checkpoints along the international arrivals walkway. Passengers connecting from an international or trans-border arrival to another international (non-U.S.) departure in Terminal 1 go to one of these checkpoints for passport control and immigration checks, then are immediately directed to Pier F for departure. This alleviates the need to recheck bags, pass through security screening, and relieves congestion in the primary customs hall. An eight-level parking garage with 8,400 public parking spaces (including 700 rental car spaces)  across from Terminal 1 is connected to the terminal by several elevated and enclosed pedestrian walkways. Terminal 3 is a 178,000-square-metre (1,916,000 sq ft) facility designed by B+H Architects and Scott Associates Architects Inc. It is used by all SkyTeam and Oneworld airlines that serve Pearson, along with Air Transat, Etihad Airways, Sunwing Airlines, WestJet and all other airlines that are unaffiliated with an airline alliance (except Emirates, which uses Terminal 1). Terminal 3 has 46 gates: B1a-B1d, B2a, B2c, B3-B5, A6d-A6f, A7–A16, B17-B20 (Also, A17-A20 for transborder flights), B22-B29, C30-C36 and B37–B41. A 5-level parking garage with 3,800 public parking spaces (including 600 rental car spaces)  is located directly across from the terminal along with the Sheraton Hotel, both of which are connected to Terminal 3 by an elevated pedestrian walkway. Since June 2018, the GTAA has used the Infield Concourse to act as an extension of Terminal 3 to provide additional bridged gates. Passengers on flights arriving or departing from gates at the Infield Concourse are transported by bus to/from Terminal 3. The Infield Concourse was originally built to handle traffic displaced during the development and construction of the current Terminal 1. Its 11 gates (521 to 531) were opened gradually throughout 2002 and 2003, and a business lounge was opened in 2005. In 2009, the Infield Concourse (also known as the IFC) was closed for regular operations in conjunction with the official opening of the newly constructed Terminal 1. However the GTAA retained plans to reactivate the IFC for regular operations whenever necessary to accommodate seasonal or overflow demand. Renovations were completed at the Infield Concourse in early 2018, and on June 5, 2018, the terminal was reactivated for summer operations by the GTAA to act as an extension of Terminal 3 with the purpose of providing required additional bridged gates. Passengers are transported by bus between Terminal 3 and the Infield Concourse. The IFC is also frequently used as a location to film major motion pictures and television productions. Skyservice FBO operates an 800-square-metre (8,611 sq ft) private VIP terminal at Toronto Pearson on Midfield Road, in the infield area of the airport. The terminal handles most private aircraft arriving and departing at Pearson, providing passenger services that include 24/7 concierge, private customs and immigration facilities, personalized catering, showers, direct handling of baggage, and VIP ground transportation services. Toronto Pearson has five runways, three of which are aligned in the east-west direction, and two in the north-south direction. A large network of taxiways, collectively measuring over 40 km (25 mi) in length, provides access between the runways and the passenger terminals, air cargo areas, and airline hangar areas. Toronto Pearson is home to the Toronto Area Control Centre, one of seven area control centres in Canada operated by Nav Canada. The airport utilizes a Traffic Management Unit (TMU), located in the apron control tower at Terminal 1, to control the movement of aircraft and other airport traffic on the ground. The main air traffic control tower at Pearson is located within the infield operations area of the airport. The airfield maintenance unit is responsible for general maintenance and repairs at Pearson. During the winter months, the unit expands into a dedicated 24-hour snow removal team of 201 workers tasked with ensuring normal operations at the airport, as Pearson regularly experiences 110 to 130 centimetres (43 to 51 in) of total snow accumulation in a typical winter season. The airport employs over 94 pieces of snow removal equipment, including 11 Vammas PSB series and 4 Oshkosh HT-Series snowplow units, and 14 snowmelters. Pearson Airport's Central De-icing Facility is the largest in the world, with a team of 168 workers servicing over 10,500 aircraft each winter. The six de-icing bays, covering a total area of 24 hectares (60 acres), can handle 12 aircraft simultaneously and take between 2 and 19 minutes to de-ice each aircraft dependent on factors such as active weather and aircraft specifications. The Greater Toronto Airports Authority (GTAA) Fire and Emergency Service maintains 3 stations at the airport, with a team of more than 80 firefighters providing fire and rescue operations at Pearson. They are equipped with 6 crash tenders as well as several pumpers, aerial ladders, and heavy rescue units. The GTAA Fire and Emergency Service operates in conjunction with the Fire and Emergency Services Training Institute (FESTI), located at the northwest end of the airport grounds. Toronto Pearson handles over 50% of total international air cargo in Canada. The airport has three main cargo facilities, known as Cargo West (Infield), Cargo East (VISTA), and Cargo North (FedEx). The Cargo West facility (also known as the Infield Cargo Area) is located between runways 15L/33R and 15R/33L. It is a multi-tenant facility including three large buildings with 52,600 square metres (566,000 sq ft) of warehouse space, a common use cargo apron, vehicle parking, and a truck maneuvering area. A four-lane vehicle tunnel connects the Infield Cargo Area to the passenger terminal area of the airport. The Cargo East facility (also known as the VISTA cargo area) is located north of Terminal 3. The VISTA cargo area is a multi-tenant facility of several buildings organized in a U-shape, with 29,500 square metres (318,000 sq ft) of warehouse space and an adjacent common use cargo apron. The Cargo North facility is the Canadian hub for FedEx Express. The site occupies an area on the north side of the airport lands near runway 05/23, and is home to two buildings operated exclusively by FedEx with 32,100 square metres (346,000 sq ft) of warehouse space and a dedicated cargo apron. Pearson Airport has seven aircraft maintenance hangars, operated by Air Canada, Air Transat, Westjet, and the GTAA, which are used for line maintenance and routine aircraft inspections. At the north end of the airfield are numerous independently operated hangars for charter aircraft and personal private aircraft based at Pearson, along with passenger and maintenance facilities to service them. The Greater Toronto Airports Authority maintains administrative offices on Convair Drive, near the southeast corner of the airfield. Gate Gourmet and CLS Catering Services both operate dedicated flight kitchen facilities at Pearson for airline catering services. Aviation fuel (Jet A-1) is supplied by Esso Avitat and Shell Aerocentre, both located in the infield operations area of the airport. The Peel Regional Police is the primary law enforcement agency at Toronto Pearson. The Royal Canadian Mounted Police (RCMP) also maintain a Toronto Airport Detachment at Pearson which provides federal law enforcement services. The Canadian Air Transport Security Authority (CATSA) is responsible for security screening procedures at Pearson Airport. Other government agencies with security operations at Pearson include the Canada Border Services Agency (CBSA), Immigration, Refugees and Citizenship Canada (IRCC), and Transport Canada. In addition, U.S. Customs and Border Protection (CBP) and United States Citizenship and Immigration Services (CIS) also conduct operations at the airport to facilitate United States border preclearance. The Union Pearson Express is an airport rail link running between Pearson Airport and Union Station in Downtown Toronto, with intermediate stops at Weston and Bloor GO Stations. Trains depart every 15 minutes from Toronto Pearson Terminal 1 station and provide a 25-minute travel time to Union Station, the busiest multimodal transportation facility in Canada. The UP Express operates daily between 5:27 am and 12:57 am. The Link Train is an automated people mover that facilitates inter-terminal transportation at Pearson Airport. It runs between Terminal 1, Terminal 3, and the Viscount Value Park Lot, connecting to the airport terminals at Toronto Pearson Terminal 1 station and Toronto Pearson Terminal 3 station. The Link train operates daily, 24-hour service with trains departing all stations every 4 to 8 minutes. 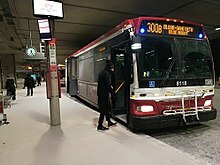 The Toronto Transit Commission operates daily, 24-hour public transit bus service from Pearson Airport to various stations in Toronto, with "Airport express" service to Kipling station on the Line 2 Bloor–Danforth subway line, and local/express rush hour service to Lawrence and Lawrence West stations on Line 1 Yonge–University. The TTC Blue Night Network operates local night bus routes to Warden Avenue, Eglinton station and Sunnybrook Hospital. Although the airport terminals are situated outside of the Toronto city limits, TTC services at Pearson do not require a supplementary fare. TTC buses arrive and depart from Terminal 1 and Terminal 3. 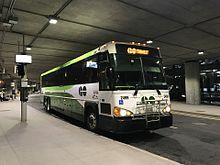 GO Transit operates daily, 24-hour public transit coach service from Pearson Airport to cities across the Greater Toronto Area with express service to Richmond Hill Terminal and Hamilton GO Centre, and local service to Finch Terminal. GO Transit coaches arrive and depart from Terminal 1. MiWay operates all-day public transit bus service from Pearson Airport to the city of Mississauga, with express service to City Centre Transit Terminal, Humber College, and Winston Churchill Transitway Station, and local routes to Westwood Square Terminal, Renforth station, Meadowvale Town Centre Terminal, and Islington station. MiWay busses arrive and depart from Terminal 1, Terminal 3, Toronto Pearson Viscount Station, and the infield operations area of the airport. Brampton Transit operates all-day public transit bus service service from Pearson Airport to the city of Brampton, with express service operating to Bramalea Terminal. Brampton Transit busses arrive and depart from Terminal 1. Greyhound Canada operates daily intercity coach service from Pearson Airport to the Toronto Coach Terminal, cities across Southern Ontario, and select cities in the U.S. states of New York and Michigan. Greyhound Canada coaches arrive and depart from Terminal 1. Taxicabs and limousines can be accessed at designated taxi stands located outside of both Terminal 1 and Terminal 3. Only official airport-licensed taxis and limousines can legally pick up passengers at Pearson, and all airport-licensed taxi and limo companies use GTAA authorized flat rate fares for travel from the airport. Transportation network company services Uber and Lyft are available at Pearson Airport. Designated rideshare pickup zones are located at both Terminal 1 and Terminal 3. Toronto Pearson is directly accessible from Highway 427 and Highway 409 with Airport Road and Dixon Road providing local access to the airport. There are 12,200 parking spaces available in parking garages adjacent to Terminal 1 and Terminal 3, in addition to several other parking lots located in the immediate area. Car rentals are available from various major car rental agencies located in the parking garages adjacent to both terminals. Car rentals are also available from off-airport car rental agencies located near Toronto Pearson Viscount Station, accessible from both terminals via the Link Train. Pearson is served by several out-of-town van and minibus shuttle operators which provide transportation from the airport to various settlements throughout Southern Ontario, and to select cities and towns in the American states of New York and Michigan. In February 2017, the GTAA announced a proposed transit hub to be located across from Terminal 3 that would connect with Union Pearson Express and may connect with other transit lines extended to the airport like Line 5 Eglinton LRT and GO Transit Regional Express Rail. This proposal would eliminate the Link Train connecting Terminals 1 and 3 with a bridge from the transit hub to Terminal 3 and another bridge connecting Terminal 3 to Terminal 1. 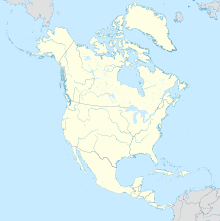 ^c : For operational and statistical purposes, a distinction is made between "transborder" and "international" flights at Toronto Pearson and at any other airport in Canada with United States border preclearance. 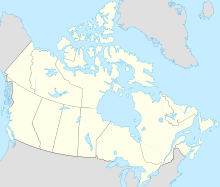 A "transborder" flight is a flight between Canada and a destination in the United States, while an "international" flight is a flight between Canada and a destination that is not within the United States or Canada, and a "domestic" flight is defined as a flight within the Canadian territories only. On October 3, 1959, Vickers Viscount CF-TGY of Trans-Canada Air Lines was written off when it landed short of the runway. No fatalities among the 38 on board. On February 10, 1960, a Super Constellation of Trans-Canada Air Lines was seriously damaged when it overran the runway after landing in bad weather. None of the 59 passengers and crew were injured. On June 13, 1964, Vickers Viscount CF-THT of Air Canada was damaged beyond economical repair when it crash-landed after the failure of two engines on approach. The airport's deadliest accident occurred on July 5, 1970, when Air Canada Flight 621, a DC-8 jet, flew on a Montreal–Toronto–Los Angeles route. The pilots inadvertently deployed spoilers before the plane attempted landing, forcing the pilots to abort landing and takeoff. Damage to the aircraft that was caused during the failed landing attempt caused the plane to break up in the air during the go-around, killing all 100 passengers and nine crew members on board when it crashed into a field southeast of Brampton. Controversy remains over the cleanup effort following the crash, as both plane wreckage debris and human remains from the crash are still found on the site. On August 30, 1970, Douglas C-47 CF-JRY of D G Harris Productions was damaged beyond economic repair in a storm. On June 26, 1978, Air Canada Flight 189 to Winnipeg overran the runway during an aborted takeoff, and crashed into the Etobicoke Creek ravine. Two of the 107 passengers on board the DC-9 were killed. On June 22, 1983, Douglas C-47A C-GUBT of Skycraft Air Transport crashed on takeoff roll at Toronto International Airport while on an international cargo flight from Cleveland Hopkins International Airport, Ohio. Both of the crew members were killed. On August 2, 2005, Air France Flight 358, an Airbus A340-300 (registration F-GLZQ) inbound from Paris, landed on runway 24L during a severe thunderstorm, failed to stop, and ran off of the runway into the Etobicoke Creek ravine. The rear third of the plane burst into flames, eventually engulfing the whole plane except the cockpit and wings. There were 12 serious injuries, but no fatalities. The investigation predominantly blamed pilot error when faced with the severe weather conditions. ^ "Synoptic/Metstat Station Information". Retrieved May 15, 2011. ^ "Airport Divestiture Status Report". Tc.gc.ca. January 12, 2011. Retrieved February 19, 2011. ^ "TORONTO PEARSON AIRCRAFT MOVEMENT" (PDF). Torontopearson.com. Retrieved February 13, 2017. ^ a b "TORONTO PEARSON AIRCRAFT MOVEMENT" (PDF). June 1, 2017. Retrieved June 1, 2017. ^ "About Toronto Pearson". Greater Toronto Airports Authority. Retrieved June 5, 2018. ^ "Toronto Pearson Fast Facts". Airports Council International. Retrieved April 18, 2014. ^ a b "TORONTO PEARSON (Enplaned + Deplaned ) PASSENGER 2014-2018" (PDF). Torontopearson.com. Retrieved October 18, 2018. ^ "Chapter 14: Land Use" (PDF). The Airport Master Plan (2000-2020). Greater Toronto Airports Authority. Retrieved January 26, 2012. The Airport occupies some 1,867 ha (4,613 acres) and is adjacent to Highway 401, the main east/west highway route through southern Ontario and the busiest highway in North America. The bulk of the Airport (1,824 ha 4,507 acres) is within the City of Mississauga with 43 ha (106 acres) located within the City of Toronto. ^ "Chapter 6: Passenger Terminals" (PDF). Greater Toronto Airports Authority. Retrieved July 23, 2018. Toronto Pearson now operates two main passenger terminals, Terminal 1 and Terminal 3. ^ "About Air Canada - Corporate Profile". Aircanada.com. Retrieved July 24, 2018. Air Canada's four hubs, Toronto (YYZ), the primary global hub, Montreal (YUL), the gateway to French international markets, Vancouver (YVR), the airline's premier gateway to Asia Pacific, and Calgary (YYC), offer Air Canada customers smooth connections under one roof. ^ "Airports in the national airports category (Appendix A)". 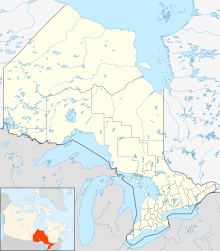 Transport Canada. December 16, 2012. Archived from the original on June 7, 2011. Retrieved January 2, 2013. ^ "Preclearance Locations - U.S. Customs and Border Protection". U.S. Department of Homeland Security. Retrieved June 1, 2018. ^ "Airlines & Destinations: Canadian Destinations". Torontopearson.com. Retrieved July 14, 2014. ^ "TORONTO PEARSON - AIRPORT 101" (PDF). Torontopearson.com. ^ "Airlines and Destinations: International Destinations". Greater Toronto Airports Authority. Retrieved July 11, 2014. ^ "Airlines and Destinations: US Destinations". Greater Toronto Airports Authority. Retrieved July 11, 2014. ^ Dexter, Brian (March 16, 1974). "Malton residents say they've had enough". Toronto Star. p. B09. ^ a b c "GTAA Master Plan" (PDF). p. 1.19. ^ "About GTAA". Torontopearson.com. Retrieved September 11, 2017. ^ Jamie Patterson (January 30, 2007). "Goodbye Terminal 2, Hello Pier F". Torontoist.com. Retrieved April 16, 2019. ^ a b c d "Toronto Pearson Master Plan 2017-2037" (PDF). Retrieved January 23, 2018. ^ Harold D. Kalman. "Airport Architecture". Thecanadianencyclopedia.com. Retrieved January 2, 2013. ^ Schwartz, Adele C. (December 1, 2005). "Bonus Design". Air Transport World. Silver Spring, Maryland. Archived from the original on September 17, 2013. Retrieved September 16, 2013. ^ "ThyssenKrupp Airport Systems on growth track" (Press release). ThyssenKrupp. April 11, 2006. Archived from the original on July 12, 2012. Retrieved January 2, 2013. ^ "Toronto Pearson International Airport – Terminal 3 - B+H Architects". Bharchitects.com. ^ "Sheraton takes over Swissotel, increases Metro hotels to 4". Toronto Star. October 8, 1993. p. F7. Retrieved September 22, 2010. ^ a b "International Departures - Toronto Pearson". GTAA. Retrieved June 26, 2018. Passengers flying on Aer Lingus, Azores, Icelandair, Condor and Ukraine International will be boarding their aircraft at the Infield Terminal, accessed by bus that leaves from Terminal 3. ^ "Toronto Pearson International Airport - Infield Development Project". Bharchitects. 2013. Archived from the original on November 14, 2013. Located on a 470-acre [190 ha] site between four major runways, this $250 million development is Canada's largest design-build project and comprised of six structures totaling 1,356,360 square feet: the Air Canada Maintenance Building, three cargo buildings including the Air Canada Cargo Terminal, a 3-bay Hangar Facility, and the 11-gate Infield Holdroom Terminal. ^ "Air Canada opens new Maple Leaf Lounge at the Infield Terminal at Toronto Pearson Airport". Express Voyage. February 10, 2005. Archived from the original on September 17, 2014. Air Canada will officially open its newest Maple Leaf Lounge at the Infield Terminal at Toronto Pearson Airport on February 10, 2005. ^ "Lights, cameras and action at Toronto Pearson International Airport". Archived from the original on September 17, 2014. Retrieved July 12, 2014. ^ a b "Skyservice Toronto Airport FBO - Fixed Base Operations". Skyservice.com. Retrieved September 18, 2017. ^ "Chapter 10 - Business Aviation" (PDF). GTAA. ^ Barnard, Linda (September 6, 2017). "How to hide a celebrity at the Toronto International Film Festival". Toronto Star. Retrieved September 11, 2017. ^ "Chapter 1 : Introduction" (PDF). Torontopearson.com. Retrieved October 18, 2018. ^ "About GTAA : Strategy Master Plan" (PDF). Torontopearson.com. Retrieved October 18, 2018. ^ Christopher Hume (December 14, 2012). "All Eyes on the Ground". Toronto Star. Retrieved January 3, 2013. ^ "Routine Maintenance at Toronto Pearson". GTAA. Retrieved January 26, 2019. ^ a b "Winter Operations". GTAA. Retrieved January 26, 2019. ^ Kelly, Cathal (November 29, 2019). "Clearing Pearson airport for takeoff in winter". Toronto Star. ^ "Oshkosh HT-Series Chosen by Toronto International Airport | Team Eagle Ltd. ~ Your Airfield Solutions Partner". Team-eagle.ca. August 4, 2010. Retrieved April 14, 2013. ^ a b "Winter Operations". Greater Toronto Airports Authority. Retrieved December 10, 2013. ^ Patel, Arti (February 3, 2011). "Clearing a Plane of Snow is Deicing on the Cake". The Globe and Mail. ^ a b "About Pearson Airport Professional Firefighters Association (PAPFFA)". PAPFFA. Retrieved June 5, 2018. ^ "Location - FESTI". Fire and Emergency Services Training Institute (FESTI). Retrieved April 9, 2019. ^ "Toronto Pearson International Airport - Master Plan 2017-2037" (PDF). Greater Toronto Airports Authority. Retrieved July 31, 2018. Toronto Pearson handles about 50 per cent of the international air cargo in Canada, making our airport a critical link in the supply chain of Canadian businesses. ^ "Advanced Cargo Facilities". GTAA. Retrieved January 3, 2013. ^ a b c d e f "GTAA Master Plan" (PDF). GTAA. Retrieved February 9, 2016. ^ "Inside Pearson Airport's ultra-luxe private hub for celebs, executives and well-to-dos - Toronto Life". Archived from the original on July 3, 2015. Retrieved September 11, 2017. ^ "Airport Division - Peel Regional Police". Peel Regional Police. Retrieved February 11, 2016. ^ ""O" Division Greater Toronto Area (GTA) - Royal Canadian Mounted Police". Royal Canadian Mounted Police. Retrieved February 11, 2016. ^ "Key Agencies - Toronto Pearson International Airport". Greater Toronto Airports Authority. Retrieved July 22, 2018. ^ Group, Travelweek (October 3, 2018). "Air Canada adds Vienna ex Toronto, seasonal service to Bordeaux out of YUL - Travelweek". Travelweek.ca. Retrieved October 18, 2018. ^ a b c d e f "Air Canada Makes Strategic Enhancements on Eastern Canadian Regional Routes for Spring 2019". Air Canada. February 14, 2019. Retrieved February 23, 2019. ^ Fechter, Joshua (January 31, 2019). "San Antonio airport losing more than a dozen flights, including nonstop to Toronto". San Antonio Express-News. ^ Liu, Jim. "Air Canada moves Toronto – Portland OR service to rouge from May 2019". Routesonline. Retrieved March 17, 2019. ^ Liu, Jim. "Air Canada moves Iceland service to rouge in June 2019". Routesonline. Retrieved April 10, 2019. ^ "Air Italy plans Toronto launch in May 2019". Routesonline.com. Retrieved December 19, 2018. ^ "Flight schedule and operations". Alitalia. ^ "Air Canada / Austrian adjusts S19 Canada – Austria service". Routesonline.com. Retrieved October 18, 2018. ^ "PIA - Weekly Flight Schedule". Pakistan International Airlines. ^ "Buenos días, Barcelona". Westjet. October 30, 2018. Retrieved October 30, 2018. ^ "Union Station - City of Toronto". City of Toronto. Retrieved August 9, 2018. ^ "Union Pearson Express". Metrolinx. ^ Irwin Rapoport (July 6, 2006). "Airport opens automated people mover: New train system connects three terminals, parking area". Toronto: Daily Commercial News. Archived from the original on February 12, 2013. Retrieved February 12, 2013. It's a 1.5-kilometre train with three stations gliding along an elevated guideway connecting Terminals 1, 3 and a reduced rate parking area serving both passengers and employees of the Greater Toronto Airports Authority (GTAA). ^ "Terminal Link". Toronto Pearson. Retrieved January 5, 2016. ^ "900 Airport Express". Toronto Transit Commission (TTC). Retrieved August 13, 2018. ^ "52 Lawrence West". Toronto Transit Commission (TTC). Retrieved August 13, 2018. ^ "952 Lawrence West Express". Toronto Transit Commission (TTC). Retrieved August 13, 2018. ^ "300 Bloor–Danforth". Toronto Transit Commission (TTC). Retrieved August 13, 2018. ^ "332 Eglinton West". Toronto Transit Commission (TTC). Retrieved August 13, 2018. ^ "352 Lawrence West". Toronto Transit Commission (TTC). Retrieved August 13, 2018. ^ "TTC Toronto Pearson International Airport". Toronto Transit Commission (TTC). Retrieved November 2, 2018. ^ "40 Hamilton/ Richmond Hill GO Bus Schedule" (PDF). GO Transit. Retrieved August 13, 2018. ^ "34 Pearson Airport/ North York GO Bus Schedule" (PDF). GO Transit. Retrieved August 13, 2018. ^ "MiExpress 107 Malton Express" (PDF). Mississauga.ca. Retrieved August 13, 2018. ^ "MiExpress 100 Airport Express" (PDF). Mississauga.ca. Retrieved August 13, 2018. ^ "MiLocal 7 Airport" (PDF). Mississauga.ca. Retrieved August 13, 2018. ^ "MiLocal 24 Northwest" (PDF). Mississauga.ca. Retrieved August 13, 2018. ^ "MiLocal 57 Courtneypark" (PDF). Mississauga.ca. Retrieved August 13, 2018. ^ "115 Bramalea Terminal–Bramalea Road–Pearson Airport" (PDF). Brampton Transit. Retrieved August 13, 2018. ^ "Greyhound Adds Stop At Toronto Pearson International Airport". CNW Newswire.ca. April 20, 2017. Retrieved April 26, 2017. ^ "Taxis & Limousines". GTAA.com. Retrieved August 13, 2018. ^ "Taxi Tarrifs from Toronto Pearson" (PDF). GTAA.com. March 1, 2018. Retrieved August 10, 2018. ^ "Limo Tarrifs from Toronto Pearson" (PDF). GTAA.com. March 1, 2018. Retrieved August 10, 2018. ^ "Out of Town Tarrifs from Toronto Pearson" (PDF). GTAA.com. March 1, 2018. Retrieved August 10, 2018. ^ "Uber, Lyft get green light for pickups at Toronto's Pearson Airport". BNN Bloomberg Canada. June 12, 2018. Retrieved June 18, 2018. ^ "Directions: From South-QEW". GTAA.com. Retrieved January 3, 2013. ^ "Parking". Torontopearson.com. Retrieved August 13, 2018. ^ a b "Car Rentals". GTAA.com. Retrieved March 6, 2016. ^ "Out-of-Town Van Services". Gtaa.com. January 3, 2013. Retrieved January 3, 2013. ^ a b "GTAA Unveils Vision For Multi-Modal Transit Hub at Pearson - Urban Toronto". urbantoronto.ca. Retrieved September 11, 2017. ^ a b c d e f g h "TORONTO PEARSON (Enplaned + Deplaned ) PASSENGER 2003-2013" (PDF). Retrieved September 11, 2017. ^ "Accident description". Aviation Safety Network. Retrieved January 3, 2013. ^ "Skids Off Runway on Belly: 59 Safe in Crackup at Malton As Airliner Overshoots in Fog: TCA Plane Crashes Into Fence". Globe and Mail. Toronto. February 11, 1960. p. 1. ^ "Accident description". Aviation Safety Network. Retrieved October 6, 2009. ^ Wilkes, Jim (July 6, 2004). "Ghosts of Flight 621 haunt Brampton field". Toronto Star. p. A1. Retrieved January 3, 2013. ^ "CF-JRY Hull-loss description". Aviation Safety Network. Retrieved October 20, 2010. ^ "C-GUBT Accident report". Aviation Safety Network. Retrieved July 27, 2010. ^ "Aviation Investigation Report - Runway Overrun and Fire - Air France Airbus 340-313 F-GLZQ - Toronto/Lester B. Pearson International Airport, Ontario - 02 August 2005 - Report Number A05H0002". Transportation Safety Board of Canada. 2007. ISBN 978-0-662-47298-8. Public Works and Government Services Canada Cat. No. TU3-5/05-3E. Retrieved December 13, 2007. [Aussi disponible en français: "Rapport d'enquête aéronautique A05H0002"
Wikimedia Commons has media related to Toronto Pearson International Airport. Wikivoyage has a travel guide for Toronto Pearson International Airport. Past three hours METARs, SPECI and current TAFs for Toronto Pearson International Airport from Nav Canada as available.